On August 20, 2000, Kerry Earnhardt picked up the 1st last-place finish of his NASCAR Winston Cup career in the Pepsi 400 Presented by Meijer at the Michigan Speedway when his #71 RealTree Camouflage Chevrolet was involved in a crash after 5 of 200 laps. The finish came in Earnhardt’s series debut. Though he shares the same famous name as his father Dale Earnhardt and half-brother Dale Earnhardt, Jr., it would be a mistake to assume that Kerry had an easy rise through the ranks. Dale Sr. and his mother Latane Brown divorced when Kerry was an infant. His stepfather Jack Key instilled in Kerry a love for the outdoors, and the two often hunted and golfed. It was years before Kerry saw much of his biological father, and longer still until he began racing. When Kerry first started racing late models and street stocks in his twenties, Key was on his crew, and he’d race against both Dale Jr. and his sister Kelley. Soon, Kerry eyed a move to the professional ranks. In 1993, as Dale Sr. battled for his sixth Winston Cup, Kerry joined NASCAR’s four-cylinder short track division, the Goody’s Dash Series, and turned heads with eight top-ten finishes in 11 starts. He ranked 11th in the series standings behind champion Rodney Orr, whose ill-fated Daytona 500 attempt came just five months later. Kerry stayed on the short tracks through 1994, competing in the NASCAR Dodge Weekly Racing Series at the Hickory Motor Speedway. On a track where legends like Richard Petty and David Pearson once dominated, Kerry earned Rookie of the Year and a Top 10 in the track standings. On July 11, 1998, nearly five months after “The Intimidator” earned his lone Daytona 500 win, Kerry made his XFINITY Series debut at Myrtle Beach Speedway. Driving for Doug Taylor in the #40 Channellock Chevrolet, Kerry started 22nd and finished 23rd. Dale Jr., on his way to his first of two consecutive XFINITY championships, finished 5th that day in DEI’s #3 AC-Delco Chevrolet. In 1999, Kerry made his first XFINITY start at Daytona, scene of his best Goody’s Dash Series finish, and earned a career-best 20th. That same year, Kerry married his wife Rene. In the spring of 2000, Dale Earnhardt, Inc. began fielding an ARCA entry for Kerry, and the driver responded with sterling results. After an early crash in the Daytona opener, Kerry finished 2nd at Charlotte, 3rd at Michigan, and on June 17, took the checkered flag at Pocono by nearly two seconds over Mike Swaim, Jr.
With another runner-up finish coming in ARCA’s return to Pocono in July, rumors were already afoot that Kerry would try his hand at Cup. A report on July 22 said that Kerry had tested a Cup car at Michigan, and that the speed he put up would have been enough to start 7th. Over the next few days, reports indicated Kerry would attempt the Cup Series’ next appearance at Michigan in August, and would drive a third DEI car alongside Dale Jr. and Steve Park. By the time the deal was announced on July 28, the plan changed once more. Kerry would indeed attempt Michigan in August, but to guarantee a spot in the field, he would drive for car owner Dave Marcis. 59 years old at the time, Marcis was competing in his 33rd Cup Series season. The prolific owner-driver with the Goodyear cap and the wingtip shoes has remained a longtime friend of the Earnhardt family. Some of his #71 Chevrolets were sponsored by Earnhardt, and many others were prepared by Richard Childress. By the summer of 2000, Marcis had qualified for just five of the season’s first 21 races and had finished no better that year than 29th. Having missed the cut at Michigan in June, Marcis wasn’t planning on running the race at all – until the offer to have Kerry drive. As Marcis Auto Racing’s hauler brought Kerry’s car into the Michigan paddock, theirs was one of 49 entrants bidding for a spot in the 43-car field. Among those entered was Truck Series racer Andy Houston, who would debut a new second team from Cal Wells’ PPI Motorsports alongside Scott Pruett. Both Kerry and Houston were among the drivers not fast enough to make the field after First Round Qualifying on Friday, but both topped the charts in Saturday’s opening practice – Houston’s #96 Ronald McDonald House Charities Ford top of the board at 189.145mph and Kerry 2nd at 188.887mph. Both also picked up in Second Round Qualifying and locked themselves into the field. Kerry tied with Hut Stricklin in Junie Donlavey’s #90 Hills Bros. Coffee Ford for the fastest speed in the second round. Stricklin won the tiebreaker based on Owner Points, earning 26th on the grid, while Kerry secured 27th. Houston would roll off 35th. While Dale Sr. used his first provisional of the year to start 37th and Dale Jr. won the pole, Kerry’s entry into the race marked the first time since August 3, 1960 that a father would race against two of his sons in the same Cup race. On that day, at Birmingham, Alabama, Lee Petty finished 3rd in his #42 Plymouth while his sons Richard Petty (finished 2nd in #43) and Maurice Petty (8th in #44) also drove in a 16-car event won by Ned Jarrett. Four of the six teams sent home that afternoon at Michigan had run out of provisionals and were unable to qualify on speed: Geoffrey Bodine, just three months back from his terrifying crash in the Truck Series opener at Daytona, in Joe Bessey’s #60 Power Team Chevrolet; Darrell Waltrip, making his final Michigan start as part of his “Victory Tour 2000” retirement season in the #66 Big Kmart / Route 66 Ford; Stacy Compton, who scored his first DNQ of the year in Melling Racing’s #9 Kodiak / Cougar Ford; and Kyle Petty in the #44 Hot Wheels Pontiac. Joining them on the trip home were Kentucky driver David Keith in his second attempt at his Cup debut for Sadler Brothers Racing, and current owner-driver Carl Long, still a month away from his own Cup debut in the #85 ST Wooten Ford owned by Thee Dixon. Starting 43rd and last at Michigan was Robby Gordon. After losing his Cup Series ride with Felix Sabates in 1997 and running a one-off for Buzz McCall at Sonoma in 1998, Gordon returned with John Menard for a full-season effort. Gordon’s brightly-colored #13 Ford finished 18th in the Daytona 500, and despite a number of DNQs, the team excelled on the road courses with a 9th at Sonoma and a 4th just a week earlier at Watkins Glen. Gordon held the 43rd spot on the first two laps, and was still running near the back when the first caution fell on Lap 6. Heading through Turns 3 and 4, Kerry was racing Andy Houston for position when his #71 broke loose and slid up the track. 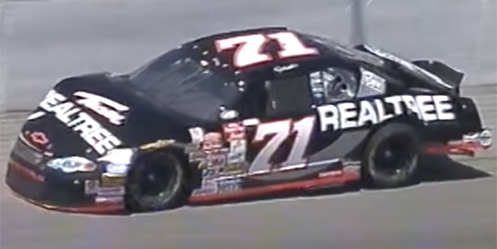 The #71 slammed the outside wall with the rear of the car, then hit again with the right-front, tearing up the suspension. Kerry managed to keep his car at the top of the track before he limped his way to pit road. The damage proved too severe to continue, and Kerry was done for the day. “Car was a little loose there, Dave Marcis was coaching me on taking it easy and everything, and right there in Turn 3, car got up under me, took the air off, and it went on around. Loose as it was, wasn’t no way I was gonna hold it. We were just trying to, you know, stay outta trouble and just be patient, get the first caution and get it tightened up, but it didn’t work out that way.” ESPN’s John Kernan also reported that other drivers indicated there was oil on the track, and that Kerry may have caught that oil before the spin. Finishing 42nd was owner-driver (and current pace car driver) Brett Bodine, who lost the engine on his #11 Ralph’s Supermarkets Ford and dropped oil down the backstretch. Next was Tony Stewart, who one week after an on-track scuffle with Jeff Gordon at Watkins Glen, found himself accidentally in his path. Running inside of Dale Jr. with his #20 Home Depot Pontiac, Stewart broke loose and spun directly in Gordon’s path, damaging both cars. While Gordon salvaged a 36th-place finish, Stewart was out in 41st. Single-car crashes continued to slow the rest of the day’s action, filling the rest of the Bottom Five. 40th went to Elliott Sadler, who pounded the Turn 2 wall after a blown right-front tire on the Wood Brothers’ #21 Citgo Ford. 39th went to Hut Stricklin in the Donlavey car, the engine blowing in a huge plume of white smoke in Turns 3 and 4. Sadly, August 20, 2000 was the only time where the three Earnhardts raced against each other. Dale Sr. lost his life less than six months later, and Kerry wouldn’t race in Cup again for nearly four years. Kerry made just one more race in 2000, where he finished 6th in the ARCA finale at Atlanta. He scored another three ARCA wins the next year, one of them under the most tragic of circumstances. On October 4, 2001, nearly ten months after Dale Sr.’s crash, Kerry was involved in a terrible two-car accident while battling Blaise Alexander for the lead. Alexander struck the outside wall nearly head-on, killing him instantly. Kerry, whose car flipped upside-down in the crash, was credited with the victory. In the years to come, Kerry would continue to try his hand at NASCAR, most notably in the XFINITY Series. After a three-race deal with Michael Waltrip Racing in 2001, Kerry signed with Fitz-Bradshaw Racing in 2002 for his first full-season effort in the series. Kerry finished 22nd in points that year on the heels of two Top Fives, including a runner-up to Jeff Burton at Kansas. The Fitz-Bradshaw team also made six more Cup Series attempts over the next two years, but each time he missed the cut – three times by a single position. It wasn’t until April 25, 2004 that Kerry finally got another chance at the Cup Series, and he made the most of it. Tabbed to drive a fourth Richard Childress car at Talladega, Earnhardt qualified his #33 Bass Pro Shops / Tracker Boats Chevrolet into the field and contended for the lead through the race’s first half before a late crash left him 35th. The run proved so popular that Kerry was a frontrunner for the inaugural “Fan Vote” in the All-Star Race, only for his Chevrolet to be destroyed in a freak accident caused by Casey Mears’ transmission failure at the start. Kerry made a total of seven Cup starts through 2005 with a best finish of 17th, again at Talladega. He drove one full season in the Truck Series in 2006, again finishing 22nd in points, and ran his 72nd and most recent XFINITY Series race at Daytona on July 3, 2009, finishing 38th for Rick Ware. Kerry, who closely resembles his father, also drove one of his father’s GM Goodwrench Chevrolets at the 2015 Goodwood Festival of Speed. Off the track, Kerry has still been actively involved in racing. Kerry joined the management team at DEI as a driver development coach from 2006 through 2011, then turned his attention to the racing careers of his two sons, Jeffrey Earnhardt (now driving the #33 Hulu Chevrolet for Circle Sport with The Motorsports Group in Cup) and bobby Dale Earnhardt (who attempted his XFINITY debut last month at Iowa for Motorsports Business Management). Kerry is also still an active outdoorsman, as both he, Kelley, and Dale Jr. are involved in his Earnhardt Outdoors program. Kerry and his wife Rene have also branched out into real estate, designing the “Earnhardt Collection,” customizable homes built by Schumacher Homes. A court case between Kerry and Teresa Earnhardt over the naming rights is ongoing. *This marked the first last-place finish for car #71 in a Cup Series race since July 26, 1998, when Dave Marcis’ #71 RealTree Camouflage Chevrolet was involved in a crash after 110 laps of the Pennsylvania 500 at Pocono. Earnhardt’s finish remains the only last-place run for the #71 in a Cup Series race at Michigan. *Craig, Andrew. “GRR talks FoS and the legend of ‘Number Three’ with Kerry Earnhardt,” Goodwood Road and Racing, June 25, 2015. *Fowler, Scott. “NASCAR’s Dale Earnhardt Jr. takes a side in family feud over Earnhardt name,” Miami Herald, May 27, 2016.